Until the mid-1800's German and Viennese orchestras were generally limited to theaters and royal courts; they rarely gave concerts or performance events of their own accord, and they followed the local ballet schedule performing the current show's repertoire when they were able to give a concert. The Vienna Opera Orchestra, however, began to perform commissioned pieces by Mozart in the 1780's, and in 1800 Beethoven requested that they premier his first symphony. Although the orchestra remained very closely tied to the Opera, these were among its first money-making ventures as a solely instrumental ensemble. Following further commissions from Beethoven the orchestra began to perform excerpts from his works during opera intermissions or after productions, a move that earned the orchestra visibility as a highly skilled ensemble worthy of independent attention. In 1842 the independent orchestra generated enough revenue, along with partial funding from the opera company, to give its first autonomous concert of pieces selected by the orchestra. The orchestra and its new music directors Franz Lachner and Otto Nicolai gave a successful performance and named the orchestra to pay homage to the composers featured in their first concert, the Viennese masters. The Wiener Philharmoniker was born, and it continued to concertize separately from the Vienna Opera in addition to its already demanding schedule. In 1933, when the final contract of Clemens Krauss expired, the orchestra decided to abandon the subscription conductor system and instead hire a conductor with an extended contract. The selection process proved arduous, however, and they struggled to settle on someone. As a result the Philharmonic was forced to invite guest conductors to complete their interim seasons during the selection process. The members, who enjoyed the collaboration with many great conductors, decided against the new hire and instead continued to bring in various conductors throughout their seasons. The orchestra's prestige allows them to continue this today since it remains a great honor to conduct the fine ensemble, and their invitation is seldom refused. The Vienna Philharmonic is also unique for the instruments played by its musicians. Instead of performing with their personal instruments, as is common practice in most other orchestras, members of the Vienna Philharmonic must use the set of instruments owned by the orchestra. The string section has been collected meticulously since the ensemble was founded as the Vienna Opera Orchestra, long before the Vienna Philharmonic separated. These violins, violas, cellos, and basses are renowned for their uniform sound and unique, Viennese timbre. The first violin section currently houses four Stradivarius violins, but the Philharmonic itself admits the rest of the stringed instruments are "of no outstanding quality". This is puzzling given the string section's legendary sound quality; the secret is in how the instruments are played. The Vienna Philharmonic says, "the string section of the Vienna Philharmonic is more like a workshop in the middle ages, where newly-arrived musicians are initiated into and absorb the secrets of the orchestra's special musical style." In other words the players are trained extensively to learn how to produce the orchestra's unique sound regardless of the instrument they play. In addition, the wind instruments are, for the most part, different from those used in the United States and elsewhere. The Viennese trumpet and tuba swap the conventional piston valves for smoother rotary valves (the tuba retains the standard contrabass extension). Similarly, the horn swaps the standard rotary valve for an unconventional modified piston valve called the pumpenventil, which gives the horn an equally milky, sultry tone. The clarinet and oboe sustain most of the change in the woodwinds. The clarinet is set up slightly differently in the German-system instead of the Boehm-system, and the oboe is almost entirely different; it is in a different key, and the fingerings are entirely changed. This makes it difficult for foreign oboists to gain membership. Another historically notable aspect of the orchestra is its hiring process. Musicians cannot be appointed to the Philharmonic directly. They audition for a panel judges from the Philharmonic, but if selected must enter a trial tenure as a member of the Vienna Opera Orchestra. It is during this period that new appointments are observed by veteran members of the Opera Orchestra and monitored by current members of the Philharmonic. The audition term usually lasts three years, and a player will be promoted to the Philharmonic if they continue to play at the high level of his/her audition. If a musician is not successful in doing so, they will either be rehired to the Opera Orchestra for a second-chance term or dismissed from both orchestras altogether. An attentive viewer will notice that in the video of the Prokofiev women are completely absent from the ensemble. Cue controversy. The Vienna Philharmonic began in a time when women were excluded from the majority of the world's major orchestras, a tradition they upheld until recently. The Vienna Philharmonic openly banned women from membership in the orchestra, not even allowing them the benefit of an audition. In response to fervent protest from musicians and media worldwide the Philharmonic formally amended its audition requirements to allow female applicants beginning in 1997. The orchestra immediately hired longtime guest harpist Anna Lelkes to applause from international audiences, and they escaped under the radar without hiring another female for another ten years (although Lelkes retired and her replacement Charlotte Balzereit was hired in this period). A cellist, Ursula Wex, was, however, appointed to the Opera Orchestra in this period. She became pregnant during her tenure there, and when she took maternity leave upon the birth of her child she was refused promotion to the Philharmonic. She continues to play in Opera Orchestra today, nine years later, long after her tenure was scheduled to end. In 2007 the world media realized they had been lured into complacency and resumed criticism. 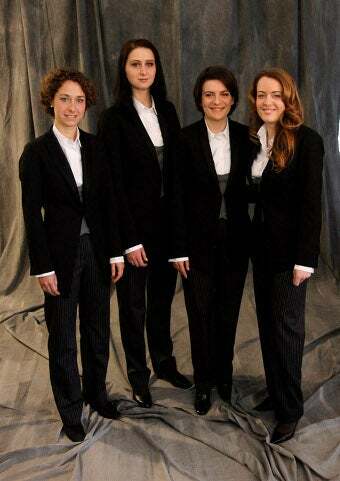 The Philharmonic made another attempt to silence critics by appointing five more women (Ursula Plaichinger, Isabelle Ballot, Daniela Ivanova, Olesya Kurylak, and Albena Danailova) to the Vienna Opera Orchestra on a track for promotion to the Philharmonic. Protesters were not so eager to turn a blind eye on their second attempt to change the orchestra's ways, so the meager increase in female membership did not appease them (about 4.7% female, compared to an average 38% among major American and European orchestras). The Philharmonic responded again by promoting Ms. Danailova to Concertmaster of the orchestra, a bold move that attracted positive international attention. Seeming to have evaded significant reform once again, the orchestra has hired no new women since the concertmaster appointment. In short, within the fifteen years the orchestra has had without a ban on female membership, only six women find themselves with seats in the Vienna Philharmonic out of a massive forty personnel replacements. Less attention has been allocated to the Philharmonic's racial hiring practices. Despite this, the facts tell a story similar to the orchestra's stance on women; the Vienna Philharmonic is ethnocentric as well as sexist. Next to none of the current Opera Orchestra or Philharmonic members are of an ethnicity other than Austrian or German. Aside from this revealing figure there are a couple of distinct scenarios that further illustrate the point. Tubist Yasuhito Sugiyama was hired by the Opera Orchestra after winning his audition with the low brass orchestra members. His appointment gave way to a massive rift within the brass section, and less than a year later he was dismissed from the Opera Orchestra. The following year he readily won an audition with the Cleveland Orchestra, so it is reasonable to infer that a lack of talent was not to blame for his unsuccessful audition process. Jeremy Wilson, a star trombonist from the University of North Texas, was faced with a similar situation. The judges were impressed with the American's ability to emulate the Viennese style, and he completed his three years with the Opera Orchestra before being appointed to the Philharmonic. After a few years performing with the Philharmonic, Wilson left for unknown reasons. As in Sugiyama's situation, racial discrimination is suspect. The orchestra's administrators claim that the Philharmonic's racial hiring practices are to maintain a cultural authenticity and to preserve the unique sound of the orchestra, something foreigners are naturally unable to do. Jeremy Wilson's case and the positive attention he received from the low brass are evidence to the contrary, though. While the Vienna Philharmonic remains a musical icon, its hiring practices haunt it with negative media attention and widespread suspicion. The conclusion is for the individual to draw; is the Vienna Philharmonic one of the few remaining culturally pure ensembles, or is it a boys' club of overt discrimination? And is "cultural purity" a laudable goal in the twenty-first century? It's a shame the Wiener Philharmoniker is so homogenous culturally. Although I see their point in attempting to maintain the Viennese sound, you don't have to be Austrian or German to learn to emulate the Viennese sound of this outstanding orchestra. Other than that, the WPO is probably one of the best orchestras in the world! I was raised in Philadelphia, where all my teachers were members of that august orchestra's bass section. I was immersed in that sound and performed thusly. When I played in the Phoenix Symphony, a section sound distinctly non-Philadelphian was expected of the players, and I adapted. I am currently in my third decade with a mid-west orchestra where my section leader, a Cincinnati Music Institute graduate, expected me to play accordingly and emulate his style. I happily complied. Individuals adapt as required to produce the anticipated result. Vienna Philharmonic will always be a premier symphony whose sound will be achieved by its players new and old.